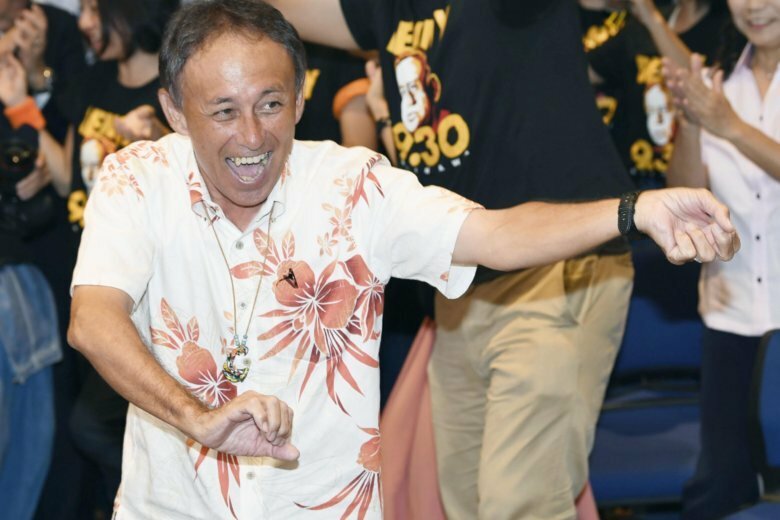 TOKYO (AP) — The celebratory crowds in Okinawa chanted the unusual first name of the southern Japanese island’s newly elected governor, shouting, “Denny! Denny! Denny!” The scene highlighted one of the first and most important questions for Denny Tamaki: How will he tackle the U.S. military presence in Okinawa as someone who is half American? Tamaki, 58, the first person with an American parent to lead Okinawa, defeated a candidate backed by the conservative pro-U.S. ruling party in Sunday’s election by a comfortable margin of 80,000 votes. At contention was the plan, decades in the works, for a new U.S. air base being built in Henoko on Okinawa’s coast. His body language after his election victory was telling. He shouted “Banzai!” in a traditional Japanese election celebration. He then danced, swaying his arms rhythmically, Okinawan-style, with his supporters, acknowledging he just couldn’t help himself. Tamaki’s political career began in local politics in 2002, and he was elected to parliament in 2009. Married, with two sons and two daughters, Tamaki has also been a radio broadcaster and a musician. He has sung in a rock band since junior high school, and wrote lyrics for some of Okinawa’s top acts, including the Rinken Band. “Let’s move forward to a new Okinawa,” he said in a tweet after his win over Atsushi Sakima, a mayor who had argued that Okinawa should work with the national government to sort out the problem. The effort to reduce Okinawa’s burden of hosting the U.S. forces would mean confronting Japan’s national defense policy, which is based on a bilateral security treaty that followed World War II. Japan sees the U.S. as its most important ally and remains highly dependent on the U.S. for defense. Okinawa houses about half of the 54,000 American troops stationed in Japan and makes for 64 percent of the land space used by the U.S. bases in the country. Okinawa makes up less than 1 percent of Japan’s land space. “It is so symbolic that a man who is part American will be leading the movement against the U.S. bases,” said Masaaki Gabe, professor of international politics at the University of the Ryukyus in Okinawa. Reflecting widespread opinion, Gabe believes Japan will likely try to bulldoze the Henoko construction. Many in Okinawa have given up and feel the rest of Japan doesn’t care, he added.